An Ice Age is any era in which the Earth is all or partly covered by ice. Though our planet has experienced a warming period recently (the last 11,000 years, with many ups and downs), it is still in an Ice Age! The current one has lasted about 2 million years, with long intervals of warmer climate. During the most recent period of glaciation in the northern hemisphere, great thicknesses of ice covered the northern continents from the Arctic down to New York and deep into the Midwest. 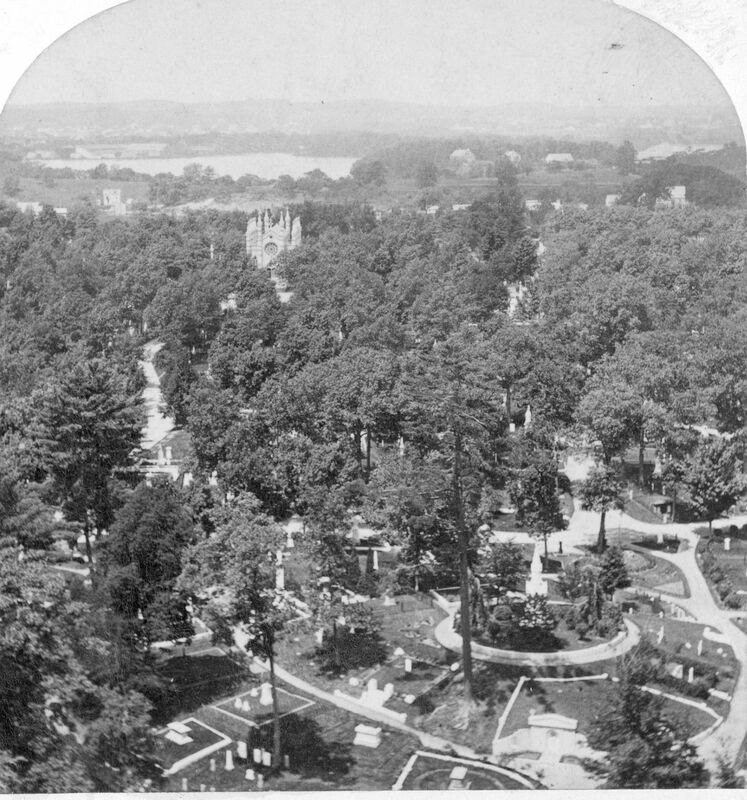 The sediments – sands, gravels, and clays – that make up Mount Auburn Cemetery were created by the crushing of bedrock beneath and alongside flowing glaciers. The sedimentary material traveled south inside a glacier or series of glaciers that occupied a valley, now buried, that runs from Roxbury across the Charles River north through Wilmington. The endpoint of a glacier, where the largest amounts of sediment are dropped upon melting, are called moraines. The Fresh Pond Moraine lies immediately to our north. The moraine sediments dropped by these glaciers as they melted were reworked by streams beneath and in front of melting glaciers (delta sediments). In some places they are poorly sorted mixes of sand and gravel (till, i.e., unsorted material dropped and left in place as the glacier melted); in other places they are well sorted, with various layers of clay, sand, and pebbles (outwash, i.e., material that was sorted by water flowing out from the retreating glacier). In the Boston area, the glacial sediments appear as pairs of layers; the lowermost is till, then outwash, then till again, etc. 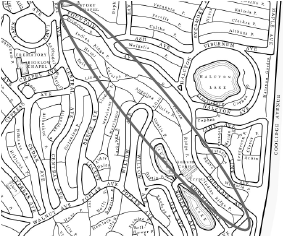 Most of Mount Auburn is classified as “Outwash 1,” that is, the earliest of three outwash layers found in the Boston Basin. Fossils barnacles and other marine creatures found in analogous sediments show that these areas were at or below sea level at the time. The sediments in this area appear to be about 14,500 years old. This is younger than the maximum extent of Pleistocene-age glaciation, which occurred about 18,000 years ago. Two later glacial lobes – large tongues of ice branching off from a larger glacier – met at the current site of Mount Auburn, one flowing south from Fresh Pond, and one flowing northeast from Allston/Brighton. These ice lobes reworked and overturned much of “Outwash 1,” further complicating an already complicated geologic picture. 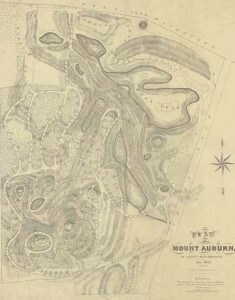 1831 Map of Mount Auburn Cemetery by Alexander Wadsworth. Notice the original shape and form of the kettle ponds Garden Pond (now Halcyon Lake) and Meadow Pond (now Auburn Lake). As the glaciers melted, blocks of ice large and small remained buried within the till. Upon melting, they formed kettle ponds. In other areas, streams of top of the glacier gradually ponded, choked with sediments, and stagnated. When the ice melted, these ponds of sediments were eased onto the ground below, forming hillocks of sediment called kames. 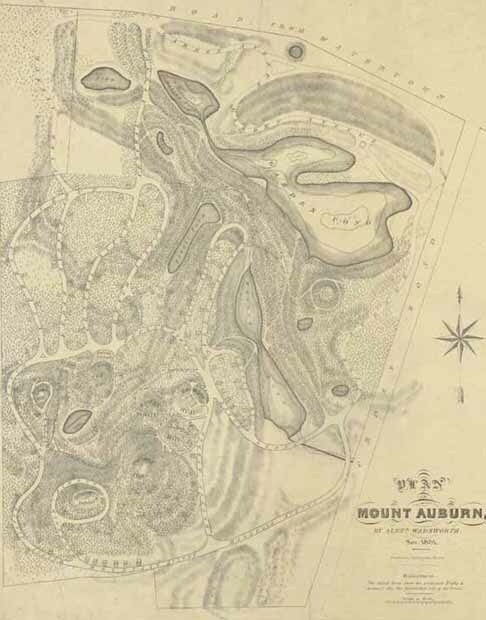 Landforms at Mount Auburn have been substantially altered by human activity, including filling, leveling, farming, and of course burials and monument construction. Nevertheless, the cemetery grounds represent a relatively well preserved glacial landscape, with eskers (Indian Ridge Path), kames (Harvard Corporation Hill and Tower Hill), and kettle ponds (Consecration Dell, Halcyon Lake, Auburn Lake). Notice the sinuous curve of Indian Ridge Path, and its steep sides. This is an esker, a long, narrow, often winding bar of glacial sediments that formed underneath the glacier itself. Meltwater carves channels beneath the ice, which are then gradually choked with sediments. When the glacier melts, the esker is left as a snaking aboveground feature. Eskers may be classified as an endangered landform, because they are very easily mined for road and cement materials. Sand and gravel companies typically start at one end of the esker and excavate it all the way to the end. Auburn Lake lies just to the southwest of the Indian Ridge Path esker. Its elongate shape suggests that its basin might have been plumbed by a lobe of ice, which depressed the underlying sediments and then melted. 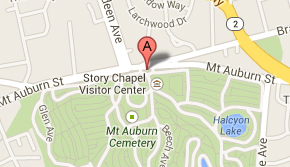 Its shape has changed little from how it appears on the first survey map of the cemetery, dated 1831. Conservation Dell is a classic kettle pond. It was formed when a large block of ice depressed the sediments immediately underneath it, and later melted. Other kettle ponds in our region are Halcyon Lake (Mount Auburn), Fresh Pond, Walden Pond, and Spy Pond. The Dell was once ringed by granite curbing and used to be dredged. 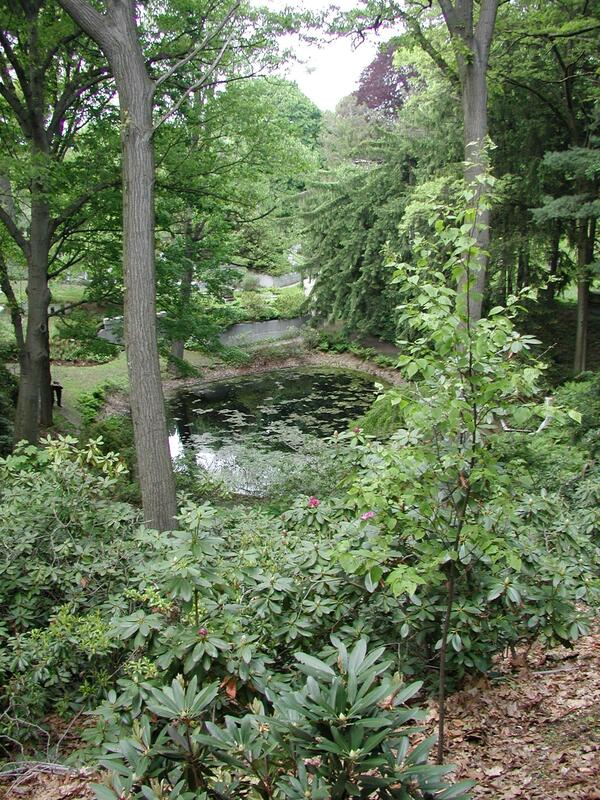 Today Mount Auburn is committed to restoring native flora and fauna. Invasive and foreign plant species have been removed from its banks. It is currently home to several threatened animal species, including turtles, spotted salamanders, and Great Horned Owls. 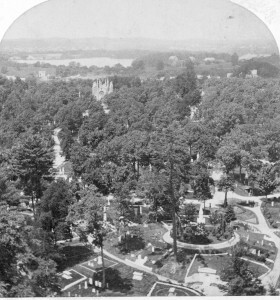 The Tower at Mount Auburn was erected in 1853. Its base is about 135 feet above sea level, and the shape of the hill strongly suggests that it is a kame, that is, a stratified hillock of sediments deposited in and reworked by a stream on top of glacial ice, then dumped as the glacier melted away. From the tower’s ramparts (62 feet above its base) one can look north up the former valley, from whence flowed the ice that brought the sediments to the area. To find north from the top of the tower, look for Bigelow Chapel (gray Gothic structure), which lies just about due north of the Tower. Beyond it in the distance you can see the Winchester highlands, which were the western boundary of the former glacial valley. Turning to the southwest, you can see bits and pieces of the industrial infrastructure left over from Watertown’s formerly thriving sand-and-gravel industry (note the yellow storage tanks). It is very likely that there were other eskers and kames in that area, which were mined for fill and building materials. Delta: The triangle of sediments that builds up at the mouth of a river or stream. Erratic: A large rock transported by flowing ice to a place far from its origin. Esker: A long, snaking bar of sand and gravel, formed in a channel of meltwater beneath a glacier. Glacier: A body of recrystallized snow that is in motion; ice bodies that are stationary, called ice fields, are not glaciers. Glaciers may be “alpine” or “valley” type, that is, relatively small in scale and only a few dozen to a few hundreds meters thick, or “continental,” that is large-scale and very massive, e.g. hundred to thousands of meters thick. Ice Age: A prolonged period of cold (ten of thousands to hundreds of thousands of years) during which masses of continental ice build up and flow across vast portions of the globe. There have been numerous such ice ages in Earth history; we are currently in an ice age, though experiencing a relatively warm spell within that ice age. Kame: A small but rather steep hillock of stratified glacial sediment. Kettle Pond (or Kettle Hole): A bowl-shaped depression in an area of glacial deposits, left behind when a lump of buried ice melts. Moraine: An accumulation of sediments deposited when a glacier melts. Lateral moraines build up along the sides of valley glaciers; terminal moraines accumulate at the snout of a glacier and can be very large, depending on the size and age of the glacier. Both Long Island and Cape Cod represent terminal moraines left behind when the continental ice melted here roughly 14–11,000 years ago. Outwash: Sorted (boulders here, sand there, clay somewhere else) and stratified sediments that build up at the head of a glacier. Outwash is reworked till. Pleistocene Epoch: The period of time just before the Present (or Holocene), during which continental ice covered much of the North American continent. About 2.5 million to 11,000 years before present. Till: Unstratified and unsorted sediments “dumped” as a glacier melts. Wow.. this is really interesting. I’ve heard a lot of these terms before but never really was able to pull them together.. and how amazing that Mt. Auburn has so many examples of these things all in one place.. I guess that’s the value of putting a place aside and not allowing any kind of mining, etc. Would you consider turning this into a Powerpoint so the public could come listen, ask questions, maybe wander around and actually look at an esker and a kame and wahtever else? I will pass along this idea Helen! We have had this as a Friends program in the past with volunteer Robin Ray and i believe that it would be great to offer again. This was a wonderful article!!! Thank you so much! I enjoyed, and learned!